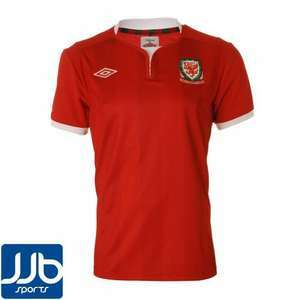 Current Wales International Football Shirt at a decent price on the JJB Ebay Store. Quite good as its the Gary Speed Tribute game on the 29th Feb or it you just fancy a new different football shirt. All sizes available as at time of listing. Its the link thats not working...the Ebay item number is 110788769839. EDIT - LINK NOW SORTED....thanks!! Ideal - saves me from having to post this. Just bought some this morning. They'll probably have a new kit for Wed's game knowing the FAW, but good deal anyway. excellent find - just ordered mine .seems too good an offer looking at the other kit on their ebay site as much dearer - the long sleeve one being £29.99 ! Not going to the Gary Speed memorial game due to prior commitments though so no drama that it won't be here from Wednesday. FYI - If previous Wales shirts are anything to go by these are quite tight fits! I'm usually a Medium but find Large a snug fit for the Welsh replica jerseys. Nice top- wish England would revert to a red home kit! says this on the page now "The listing below has been updated by the seller, but you can see the item you purchased" .. wasn't there when purchased - so what was the 'update' ?? "high-definition Wales crest embroidery. " Is 1080P?? Am I the only person in the world who didn't know who Gary Speed was until he died? Am I the only person in the world who didn't know who Gary Speed was … Am I the only person in the world who didn't know who Gary Speed was until he died? Possibly not - depends on how old you are, but I would imagine it would have been very difficult not to know who he was if you followed football with any interest between 1988 - 2011. Have England ever had a red home kit? Fishing for a debate with that title methinks. The Welsh only back who ever is winning. When their rugby/football team plays well they're all there. When they're having a bad spell they play in empty stadiums (more so for the football). I lived in north Wales for 6 years and found most pubs put the England game on even when Wales were playing. And everyone supports United or Liverpool (and wrexham, Cardiff or Swansea as second teams to keep Welsh). It's sad they're making money out of his death. Why mention Gary Speed by the way? OP clearly looking to gain heat on the back of a tragedy. Plus the fact that the last deal that mentioned his name turned into a proper debacle. Total disrespect if you ask me. The Welsh only back who ever is winning. When their rugby/football team … The Welsh only back who ever is winning. When their rugby/football team plays well they're all there. When they're having a bad spell they play in empty stadiums (more so for the football). I lived in north Wales for 6 years and found most pubs put the England game on even when Wales were playing. And everyone supports United or Liverpool (and wrexham, Cardiff or Swansea as second teams to keep Welsh). For a start, nobody in Wales gives a damn about the football. There are only three places that do, and it's still second to the Rugby - Wrexham, Swansea and Cardiff, all of which are in the English league. The rest play in the Welsh Premier for a reason.....because it's very distant second to the rugby. The Welsh team tend to play in the Liberty Stadium or Cardiff City Stadium because A) The Millennium stadium is costly to run for an organisation such as the WFA, which will generate next to no income in comparison to the FA - which makes a killing off the Premier League, so subsequently it's not that cheap to go see Wales play there and B) Who's going to pay those prices to see Wales get drubbed by Montenegro or Azerbajan, Wales were god awful under Toshack. Quite the opposite, these shirts are probably reduced to less than cost so they are actually losing money out of his death. Why mention Gary Speed by the way?OP clearly looking to gain heat on the … Why mention Gary Speed by the way?OP clearly looking to gain heat on the back of a tragedy. Plus the fact that the last deal that mentioned his name turned into a proper debacle. Total disrespect if you ask me. Nope , just you trolling. My wife is a consultant psychiatrist and she has had patients saying they are inspired by, and want to copy, Gary Speed's suicide. She also says the anguish and damage done to those left behind, especially children, is immense and often irreparable. Gary Speed had kids. The stigma was there for a reason. My uncle committed suicide and my aunt has never recovered. An ex-girlfriend's father committed suicide and she has had clinical depression ever since and her brother killed himself five years later. We shouldn't glorify suicide. Quite the opposite, these shirts are probably reduced to less than cost … Quite the opposite, these shirts are probably reduced to less than cost so they are actually losing money out of his death. Gary Speed not mentioned on the ebay listing whatsoever. His name was added by the OP to boost heat. @jonseyuk . I lived it north Wales. I went to yyscol In Wales. I want to watch teams play in tiny little grounds a lot. I'm a man City fan and me and my dad would drive back up to Manchester to Maine Road, paying very expensive prices to watch us getting beat by York etc. You support your team and country no matter how they play. Like I started my previous comment the Welsh only support who's winning. Where I lived it was mostly football where as I agree most of Wales is rugby (as I said). But it annoys me how you all get patriotic on here over something no one bothers with in Wales. Most people who buy this top on here will never go watch there team play even with Amazing players like Ramsey and Bale. We were once in a pub (family 2 4 1 pub grub type) and we asked would they put the Welsh game on as England was just a friendly. No one even cared to watch it. Its fine its not a football country. But still its a poor show that you only sing when you're winning. For the record I love Wales.